Gold is soaring. Soaring! It just clocked its highest finish since mid-May, and is enjoying its longest win streak in a month. Suddenly everyone is a gold bull. And yet most of them don’t even know why. I’ll tell you why. Let’s start with the fundamentals. The U.S. dollar is crumpling like a beaten fighter. Once king of the ring, it is headed down for the count. The Mighty Greenback lost its punch under a flurry of blows from Fed Chair Jerome Powell. Powell just said the Fed will be “patient” on its next move, his latest hammer-blow to the dollar. Bereft of its rate hike support, the dollar has gone all rubber-legged. And since gold is priced in dollars, as one takes it on the chin, the other heads higher. Now, it is gold’s turn to be in the winner’s circle. Investors can’t get enough. Have you seen what’s happening in the gold ETFs? Great googly-moogly, the funds are buying gold hand over fist. ETFs that hold physical metal have added 186 metric tons of gold since late September. That’s 5,980,000 troy ounces! And of course that’s affecting the market. That’s simple supply and demand. Look on the far right-hand side of the chart. You see how gold is pushing above that downtrend? That’s not just any downtrend. 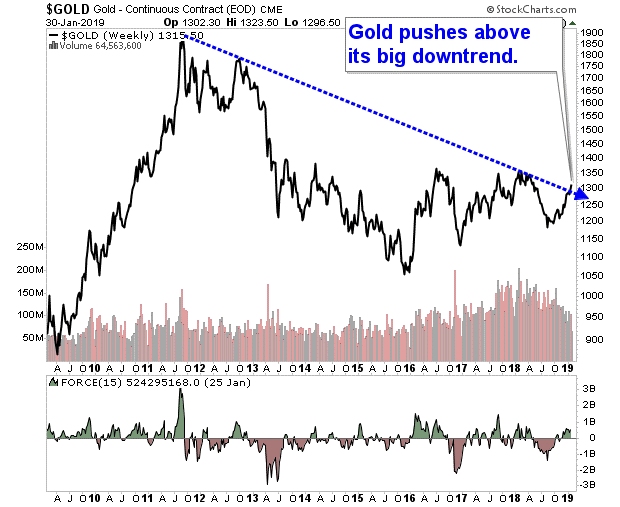 That’s the big downtrend that has held gold under its thumb since 2011. Bam! That’s what we need to see. Cry “havoc,” and let slip the dogs of gold! A decade of built-up energy in the yellow metal is about to be unleashed. The best thing about this is gold’s big rally to come won’t be a straight line. There will be zigs and zags. Surges and pullbacks. Heck, I wouldn’t be surprised to see a pullback very soon, because all the bears are throwing in the towel. First, be sure to use those pullbacks wisely. You can use them to add to your gold positions. Because the next great profit opportunity is staring you right in the face. Second, know the truth about these stock market rallies. They’re just knee-jerk reactions to a frantic Fed … and after the initial rush, these rallies won’t have a leg to stand on. Click here. Since you’re a subscriber, there’s no charge. Please relate your cycles projections to interest rates, especially U.S. Treasury bonds and 10 year notes. So far your predictions haven’t been too much help to me, because they are hollow without interest rate analysis. To be specific from my side: It is hard for me to see how your projections of emerging chaos are going to happen with Treasury notes in the 2.75 per cent zone, and still in a rally mode. Present interest rates are not forecasting chaos, and they are decent financial forecasters. They seem more concerned about stagnation. There are many things that are impressive about the fundamental and technical conditions of the GOLD price. Although the chart shows this technically significant breakout, sentiment and calendric considerations remain questionable. 1. GOLD has close to the record for FALSE breakouts among all commodities. It is decidedly one of the trickiest for technicians to trade. 2. Seasonal factors pek in the next week or so and decline into the Summer. June and Auguat are the more popular months for price lows in Gold. 3. Sentiment measures in recent days have shifted strongly to the BUY Side, which tends to be a Contrary Indicator. We would consider the recent breakout more seriously if price holds above the breakout point for several days. We will consider a breakout much more important if it caan break and hold above the Five-year Neckline of its possible basing pattern, currently between 1365-80 range.